Why bother with derating curves? When deadlines are approaching, and the pressure is ramping up, we can all be guilty of specifying components that we are pretty sure will be fit for the job at hand. If time is of the essence, and the clock is ticking, it can be all too easy to give the product’s technical data a cursory ‘glance over’ for fleeting confirmation of what we suspect the product’s performance characteristics are. What cable size are you using? What is the ambient temperature of your application? 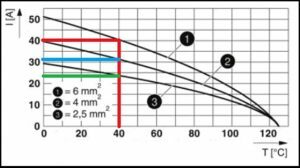 The maximum safe current for a connector is directly related to the cable size being used, and higher application temperatures can reduce the permitted maximum current! “OK, but even with that information, how does it help me when the supplier is only showing “Rated Current = 40A”?! That is where the de-rating curve comes into play. 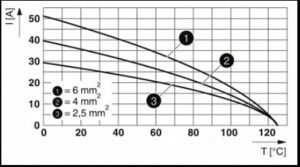 Below is a typical derating curve for our heavy duty HEAVYCON connectors. 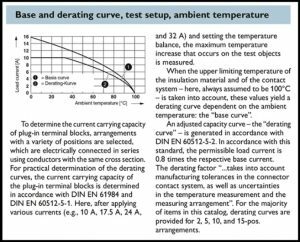 This curve is generated by testing the temperature increases of different current levels experienced by the connector according to standards DIN EN 61984 & DIN EN 60512-5-1. The DIN standards require that test results are DE-rated, and 20% of the maximum current value is deducted before generating the published curves. 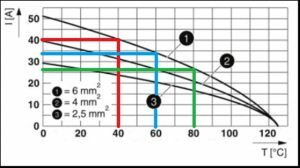 If you are using a smaller 4mm² cable (blue line) then the maximum safe current @ 40°C would be about 31A, and 2.5mm² (green line) = 24A. So this example shows you how the cable size affects the maximum safe current that you can use, but the second important factor I mentioned earlier is the ambient temperature. Not every application experiences only 40°C! The higher the ambient temperature, the lower the safe current rating. So, using the derating curve, the original question of – “The supplier’s catalogue or website is showing a Rated Current of 40A for the product I am looking at. – Yes, 35A is OK, if the cable size is 6mm² and the ambient temperature does not go above 55°C. 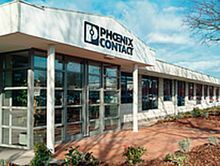 A summary of the above can be found in Phoenix Contact Catalogue technical data (see below). So, in short, we may design and build a solution that works perfectly well on a wet Wednesday in Barnsley but fails miserably when shipped and commissioned in Qatar! The derating diagrams really could save you time, money and above all, your company’s hard earned reputation!